Gold mine gold nugget gum. Remember these ? Candy coated fruit flavored gum nuggets in a cute little bag. I bet you used to tie them to your belt loop. These are perfect for kid's parties, but you will also be surprised how the adults go crazy over this old time bubble gum. 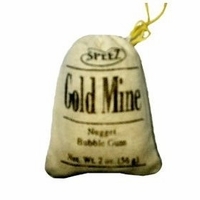 Gold mine bubble gum is perfect if you are planning a western style party or a pirate themed party. Brand May Vary. But Always Good.